Lemax Vintage Grind Coffee Company - Sights & Sounds table piece depicting a delightful coffee factory also serving the public with a taste & buy counter, where the aroma draws customers in. Trays of coffee beans are seen moving on the conveyor belt in the upper factory window, whilst gears in the front revolve, and the end result are ground bags of coffee beans moving in and out of the factory unit. Accompanied by a volume controlled soundtrack and vocal commentary. Suitable for placement in and amongst a seasonal Lemax village Christmas scene. A real spectacle with internal viewing aspects and lighting, suited for a Lemax Caddington Village themed display. This showpiece collectable model joined the growing Lemax Caddington collection in 2017. 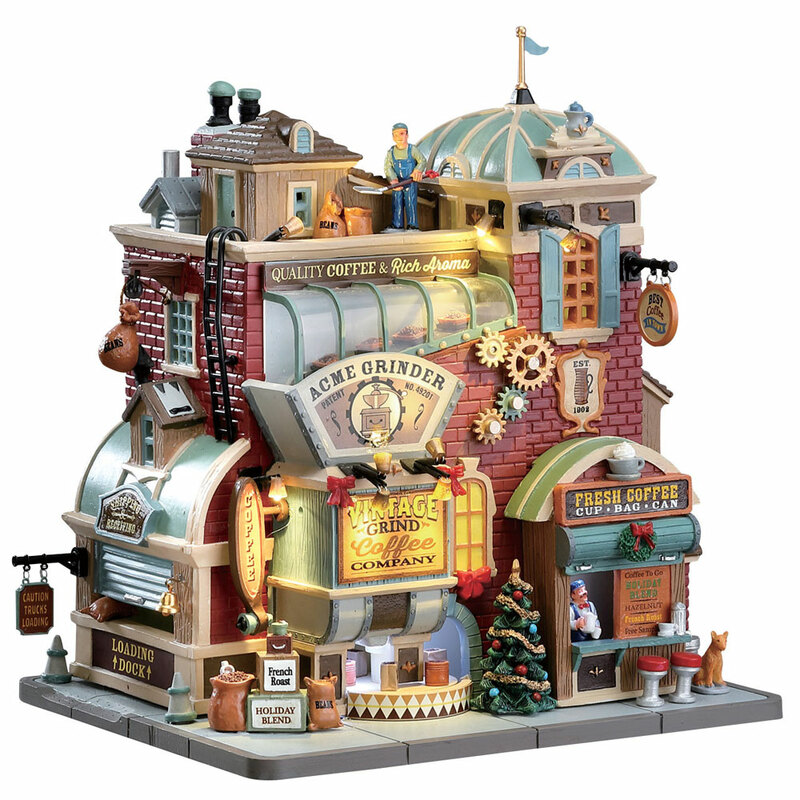 Vintage Grind Coffee Company is a piece set that offers a delightful self standing animated, illuminated building fitted with on/off sound unit , placed on an individual street base to compliment your seasonal Lemax Village.